There are the customary ways to make money — car washes, mowing lawns, babysitting, bake sales, et al. 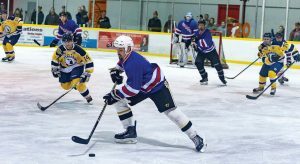 — and then there are the fun ways of bringing the whole community together and raising funds for a worthy cause — like a Battle of the Badges sporting or other competitive event. These happenings vary from city to city on the types of matches that traditionally pit police departments against fire departments or sheriff’s officers against another law enforcement adversaries. 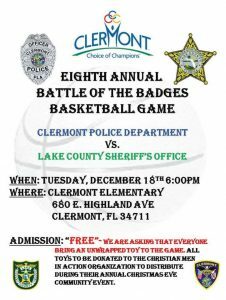 Sergeant Malcolm Draper of the Clermont, Fla., Police Department looks forward to his community’s annual Battle of the Badges in December when his department goes to war with the Lake County Sheriff’s Office during the Holiday Charity Basketball Game. “Our game benefits Christian Men in Action, a local 501c3 nonprofit organization, by providing toys to kids in the Lincoln Park community,” said Draper, adding that the toys are given out Christmas Eve at the annual Clermont Christmas party at McKinney Park. The public is encouraged to cheer for their favorite law enforcement agency and to bring an unwrapped toy as a donation/admission. The local Zaxby’s and Texas Roadhouse have generously donated a variety of raffle prizes to be given out during the game. Other local businesses provide drinks and people to sell them. Royse City, Texas, used its Battle of the Badges last December to gather more than 30 boxes of toys that were distributed to financially strained families who were unable to provide Christmas gifts to their children. The two departments — fire and police — held a toy drop-off event at the police and courts building where citizens could have a cup of hot chocolate while simultaneously donating toys. These two entities worked with Helping Hands of Rockwall, a local nonprofit that cares for families in need. During the event, a member of the Royse City Volunteer Fire Department was garbed in a red Santa costume and a member of the police department followed suit … in a blue Santa suit. A February Battle of the Badges in Placerville, Calif., had a unique twist: this competition was in the form of the 911 Chili Cook-off event for the “Best Culinarian in El Dorado County” title. Hosted by New Morning Youth & Family Services, the second cook-off was a contest of more than 21 first responders: firefighters, police, armed forces, probation, sheriff’s department and many more. A crowd-pleaser, the event also offered taste testing, the sampling of local beers and wines, booths from local business and live entertainment. A hockey face-off was held at the inaugural Battle of the Badges Charity Hockey Tournament between law enforcement and firefighters in Jackson County, Mich., to raise money for child abuse prevention efforts and other youth programs provided by a partnership of the Optimist International Club and Exchange Club of Jackson County. All the proceeds went to Jackson youth programs. 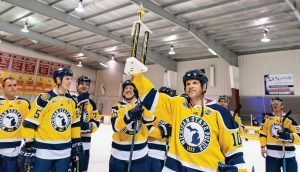 According to BOTB media and marketing chair and event organizer Ryan Kerwin, the four-team competition was between the Michigan State Police, Michigan Department of Corrections’ Black Knights, Summit Township Fire Department’s Firehogs and Great Lakes Burn Camp, all of whom have their own hockey teams. “MSP were the champions of our 2019 competition,” said Kerwin, adding that $9,000 was raised for charity. Games were 20 minutes each with a championship game at 6:30 p.m. to crown the inaugural BOTB champion. Tickets were $10 per person, which came with one free entry into a drawing for a prize. Children, 12 and under, were admitted free for this family event. Other activities included a 50/50 drawing, a photo booth, concessions — including adult beverages — and intermission games like chuck-a-puck, half-ice shot and more. For information, email battleofthebadgesjackson@gmail.com or visit the Facebook page, www.facebook.com/battleofthebadgesjacksonmi. Plano, Texas, offers a summer competition — the Plano Police Department and Plano Fire-Rescue went head-to-head as a way of encouraging Plano residents to give blood to Carter Bloodcare, according to police spokesman Davie Tilley. “Batter up!” is the rallying shout-out heard at Lewisville, Texas’, Battle of the Badges annual softball game, where the firefighters and the police department compete for the winning trophy. This year will be the 17th year Lewisville will compete, according to Heather Goodwin, president of the Lewisville Citizen Police Academy Alumni Association, which for nearly 20 years has been a volunteer-led support system for the Lewisville Police Department. “Over the 16-year history of our Battle of the Badges, our revenue has been on average $5,000,” said Goodwin. The Lewisville Fire Department and the Lewisville Police Department will come together again for the daylong tournament, which will be Oct. 19, 2019, at the Lone Star Toyota of Lewisville Railroad Park and hosted by LCPAAA. Other fire and police teams are also eligible and gather across north Texas to compete in the tournament. Clay Firefighters Local 1630 in South Bend, Ind., hosted the 18th annual Lt. Jon Kimm Memorial Battle of the Badges on March 23. Bowling was held at Chippewa Bowl and all the money raised went to Ronald McDonald House Charities of Michiana. RMHC of Michiana has 20 family rooms attached to the pediatric floor at Memorial Hospital. They provide all household essentials, meals and board for no cost to the families who stay there when their children are critically ill.
Last year $10,000 was given out, including to a Goshen woman battling cancer who received a makeover courtesy of Hello Gorgeous Inc. The Clay Fire Cares program received $2,000, which went toward those fighting cancer. Hello Gorgeous received $8,000 so it could add a new affiliate salon to help others. In the past 16 years, more than $100,000 was raised to aid others in need. Special Olympics Pennsylvania invited all members of law enforcement to join in the Battle of the Badges during its 2019 Pittsburgh Polar Plunge, which is designed to increase camaraderie between public safety agencies as well as raise funds for Special Olympics. The traveling trophy and bragging rights were what law enforcement, fire departments and EMS teams fought for, with the penultimate goal of “enabling thousands of Special Olympics athletes to continue to participate in Special Olympics activities at no cost to them or their families,” according to its website, specialolympicspa.org/pittsburgh-battle-of-the-badges. There were 20 major sponsors, and donations were taken both online and offline with one’s favorite plunger or team. To make it more interesting, there was also a Super Plunge where a group of daring adults plunged into a cold pool of water 24 times over the course of a 12-hour period. These Super Plungers are an extraordinary assembly of individuals who were committed to raising a minimum of $2,500 for the privilege of Super Plunging. Anyone was welcome to participate and past Super Plungers include law enforcement officers, parents of Special Olympics athletes, general managers of Pittsburgh sports teams and business professionals. And if hardy individuals tried out and just couldn’t tolerate the chilly water, they have a whole year to practice for the 2020 event.